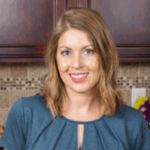 Published: Oct 16, 2017 · Modified: Apr 11, 2019 · By Jen Sobjack · This post may contain affiliate links. 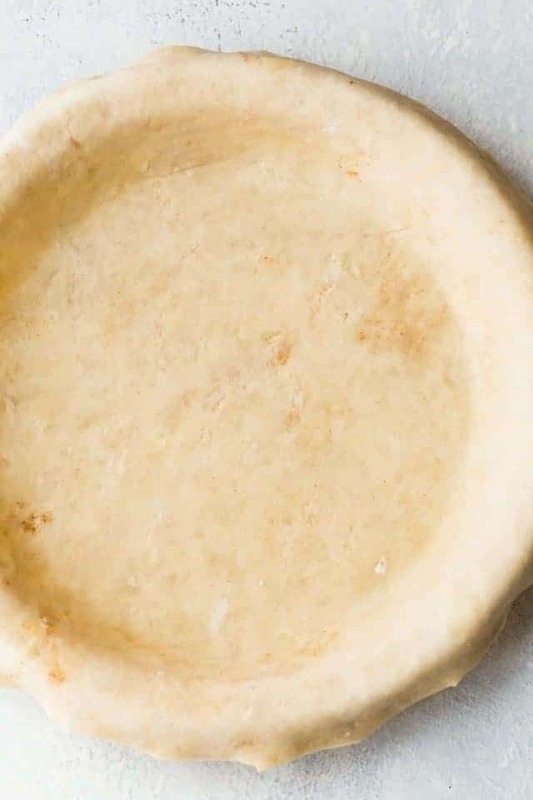 Brown Butter Pie Crust is the ultimate pastry to elevate any pie flavor. It’s nutty, sweet, luxuriously rich, buttery, and will become your go-to pie crust. I recently discovered the gloriousness of brown butter pie crust when I decided to make an apple slab pie using this crust. It’s so rich, crisp, and flaky. I found myself reaching for pieces of crust instead of the filling. 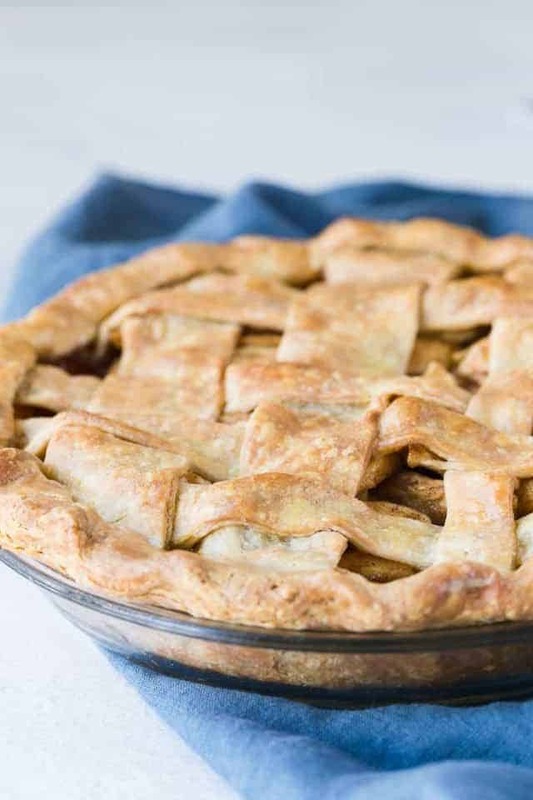 Making pie crust is often intimidating to bakers. Especially when you are not familiar with the process. 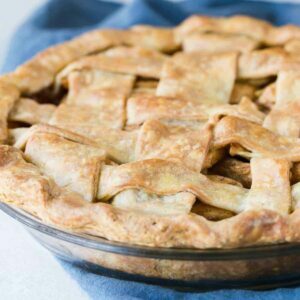 I have a full blog post on how to make homemade pie crust. I highly suggest taking a peak before you attempt this for the first time. Today’s brown butter pastry is made almost exactly the same with the exception of browning the butter first and using an egg. The egg makes the crust more like a shortbread but it’s still super flaky. This recipe may actually be my new favorite. It goes so well with apple pie and I can’t wait to try it with other fruit fillings. Browning butter is by far the best way to enjoy butter. Any recipe that calls for melted butter, use brown butter instead. You won’t regret it. You can also use brown butter for recipes that call for softened butter or cold butter. The trick to this is letting the brown butter cool until turns solid again. It takes longer but it’s honestly so worth it. Start by melting the butter in a saucepan over medium heat. The butter will foam up and then subside as it’s cooking. Let it cook for about eight minutes until it’s a light golden brown with bits of darker brown in the bottom. Once it reaches this point it can quickly turn to burnt to watch it closely and remove it from the heat as soon as it’s golden brown. 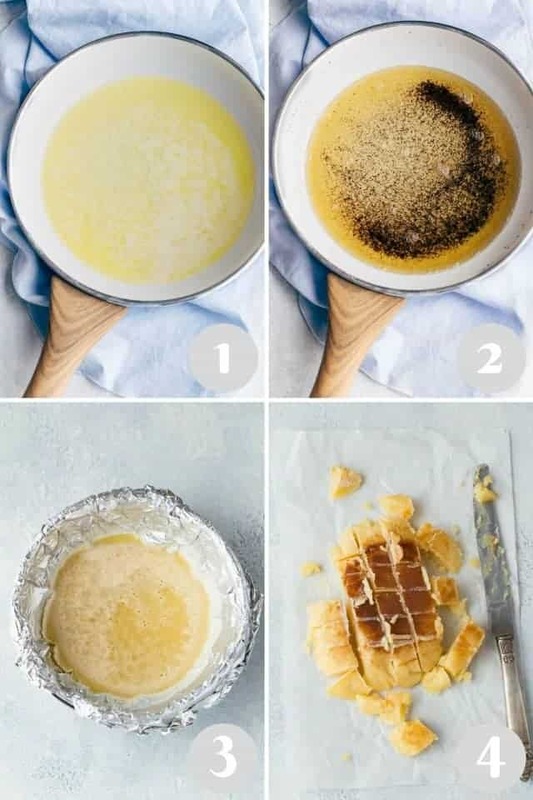 Pour the brown butter into a heatproof bowl lined with foil. Make sure to leave all those dark brown bits behind in the pot. You just want the sweet nutty butter. Pop the bowl of butter into the freezer until it becomes solid again. This took about an hour. Once it’s set, slice into cubes and it’s ready to go into the pastry dough. Make sure you let the butter solidify and keep it cold until you are ready to use it. Store it in the refrigerator if you plan to use it the next day. Cut the butter into the flour until it resembles pea-sized crumbs. Some larger bits of butter throughout is perfectly fine. This recipe calls for an egg. Whisk the egg with water and add it to the flour, using just enough to hold the dough together. You don’t want a dough that’s super wet and sticky. Divide the dough in half and wrap each half in plastic wrap. Refrigerate the dough for at least 30 minutes or up to two days. The dough can also be frozen for up to 3 months. Just thaw it overnight in the refrigerator and let it set on the counter for a few minutes before rolling it out. Like any pie crust, it’s important to keep the dough as cold as possible before baking. Place it in the refrigerator between steps in the recipe and handle it as little as possible. This recipe for brown butter pie crust yields enough to make a double pastry pie. If you need only one crust, you can keep the second disc frozen for later use. Whisk the egg and ice water together until well combined. Drizzle over the flour mixture and toss with a fork until the dough comes together. If the dough is too dry, add more ice water, one tablespoon at a time until moist enough to stick together. 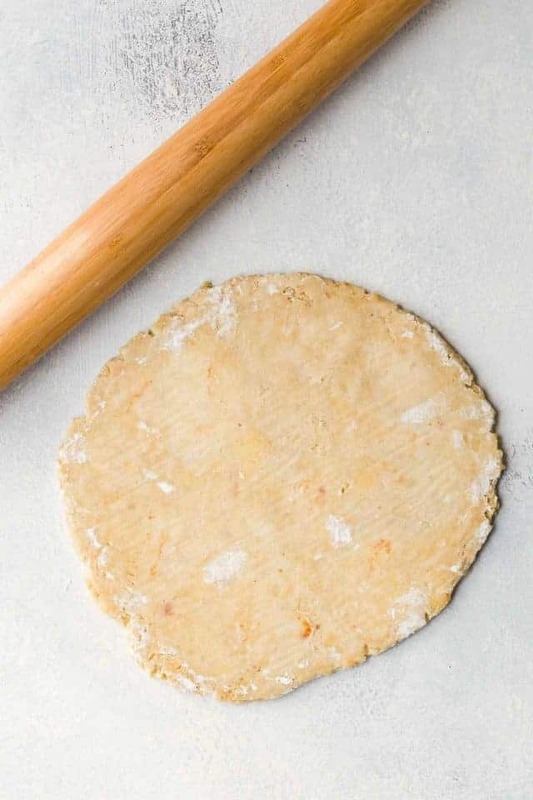 With a rolling pin, roll the dough into a 12-inch circle. Place it in a 9-inch pie pan gently without stretching it. Trim the edge so there’s a 1-inch overhang over the sides of the pie pan. Fold the excess dough under so it sits up on the rim of the pan and flute as desired. Prepare the pie dough through step 6 and freeze the discs for up to 3 months. Thaw in the refrigerator overnight before using.